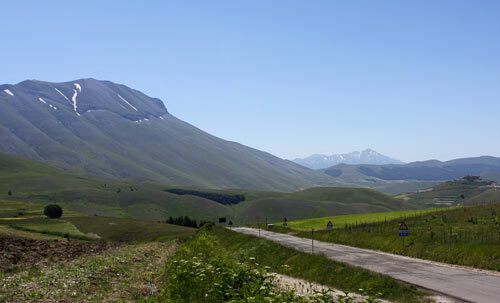 The Splendor of Piano Grande And The Sibillini Mountains | Travel Umbria! 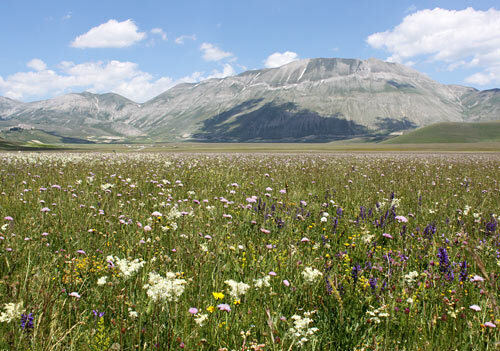 The mountainous landscape that falls east of Norcia is one of Italy’s hidden treasures, and it becomes an outdoor lover’s paradise during the spring and summer. Trails cover the countryside which are suitable for both hikers and mountain bikers, while the windy upland plains create a perfect environment for hang-gliding. Campgrounds can be found across the lower elevations and rafting is a popular activity all along the river that winds through the area. 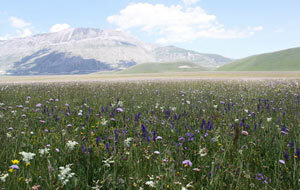 One of the most famous centerpiece of the area is the Piano Grande, a huge 16 square kilometer plain surrounded by the barren Sibillini mountain range that once was a glacier lake. This entire area falls in the Parco Nazionale dei Monti Sibillini, one of the most recently established Italian national parks, which is divided between Le Marche and Umbria. The Piano Grande attracts tourists from across the globe every spring and summer when the plains are covered in a breathtaking abundance of wildflowers called the fioritura. 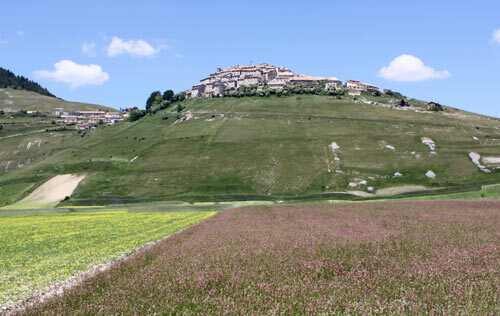 This area is also responsible for growing Umbria’s famous lentils, Lenticchie di Castellucio, which are named for the small village that overlooks the plains. 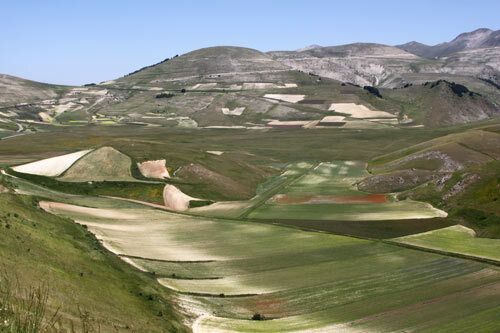 Castelluccio, an isolated farming village which sits at 1452m above sea level looks down over both the Piano Grande as well as the Piano Piccolo (a smaller plain) affording stunning views of the countryside for many miles. Castelluccio is said to be the highest elevation village with year round inhabitants in Italy, and after spending just a few hours there myself on what was a warm summer day I can certainly understand why. Although the temperatures were in the low 80′s F. when we left our farmhouse, when we arrived in Castelluccio it was very windy and cool. 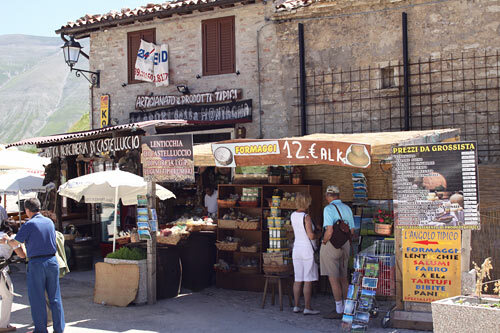 Although not a terribly attractive place, Castelluccio has a certain run down charm, and despite it’s small size, it’s population has made the most of tourist season by opening up a number of bars, and small shacks selling local artisan products such as lentils, black truffles, cured pork products, local cheese, and mountain honey. Although we had been told there was only one restaurant in Castelluccio, we did see one or two others as we were leaving. 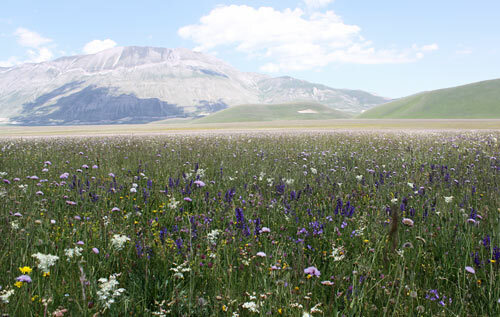 We left for Castelluccio fairly early as we knew it would be a fairly long drive and although quite a scenic drive, after two hours we were very happy when we first saw the Piano Piccolo and knew we had arrived. It is really difficult to describe the scene of the colorful plains with herds of sheep spotted across them which are dominated by the austere Sibillini mountain range which surrounds them. we drove in Castelluccio and parked in the sole parking area which was already filled with a number of tour buses and walked around the village. Unfortunately unless you are wearing hiking clothes there isn’t a lot of walking to be done in Castelluccio when you are in a party of three children, one still in a stroller, as well as one small 5lb dog. Instead, we stopped for an espresso, checked out the restaurant we had been told to dine at, and spent some time browsing through the few shops selling artisan products until lunch. We had lunch at Taverna di Castelluccio at an outdoor picnic table. We ordered the local specialties starting with an appetizer of locally cured meats, which was followed by simple pastas or lentil soup and sausages. Although nothing fancy, it was a good lunch, and after finishing up we headed back to our cars to look for the Piano Grande. 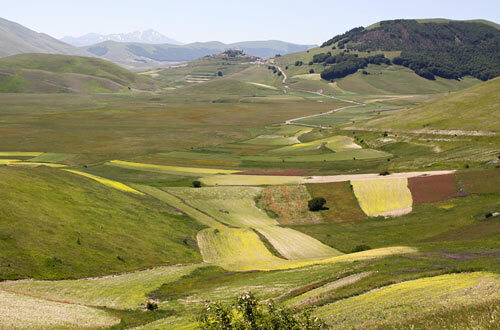 This larger plain sits on the opposite side of Castelluccio and is even more amazing than Piano Piccolo. Tourists were stopping all along the road that ran through the plain for pictures, and we followed their lead trying to capture the beauty in a photo. As we were driving through the Piano Grande a shepherd herded his flock of sheep across the road stopping oncoming traffic until they all safely crossed. I had read about this area a number of times but never managed to visit until this trip. I would certainly return in the spring/summer again to see the flowers, but would plan our trip in early July when the poppies would be in full bloom. Visiting this area is a unique experience, and visiting wildflower plains might not be something everyone would enjoy, but it could be combined with some hiking or rafting to make a full day trip. I personally plan to return at a time when we are able to do some hiking through the many winding trails that can be found throughout the countryside later this summer, so we can experience this special area in a different season.